Many choreographers have interpreted Sergei Prokofiev's definitive score for the ballet of Romeo and Juliet, though none better than Alun Jones, as we see in the Colorado Ballet's current production. Jones accomplishes this by concentrating on the emotional natures of the title characters and their love story and by simplifying the settings to accomodate this throughline and its catharsis. It's a wise choice, as we've seen other versions of the ballet truncated from excessive scene changes and an overly literal telling of the story. Jones' adaptation calls for a grand setting, which scenic designer Wally Coburg parlays into a series of classical images that mix and match with each other and a few additional key pieces. In all, it is an elevated backdrop to the most famous love story in the Western literary canon. On this stage we find the timeless Maria Mosina as the 13-year old Juliet, awash in all the hyperboles of puberty, when she learns that her parents have arranged for her marriage to Count Paris (Christopher Ellis), with whom she feels no heat. Mosina's every look, step, and posture is that of a young girl's first love and infatuation. Bottle that spritely effervescense and you're a billionaire! Alexei Tyukov is everything a Romeo should be—handsome, brave, and kind-hearted— with a knack for pantomime. Romeo may be older than Juliet, but he is still impetuous and, when filled with wine, rash. 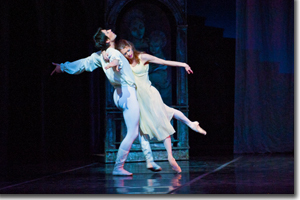 Mosina and Tyukov's pas de deux—from those first stolen moments when he cuts in on Paris, and later alone during the same party, to their transcendent moments in the courtyard below the famous balcony, and from the bittersweet aftermath of their marital consumation, when Romeo must begin his banishment, to the stunning final necromantic tango of a disbelieving and grieving Romeo with a seemingly lifeless Juliet—pull our heartstrings insistently. Jones also finds much humor in the antics of Mercutio and Benvolio, the initial rumble between the Montagues and the Capulets, the kindhearted but goofy nurse, the carnival performers, and the celebratory townfolk. 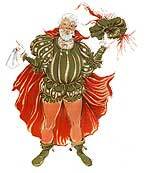 The ominous forces—Tybalt, the Prince, and Lord and Lady Capulet—are also well drawn from Prokofiev's tonal interplay. The swordplay is first rate, as is the Colorado Ballet Orchestra's warm rendition under the poetic hand of Adam Flatt. 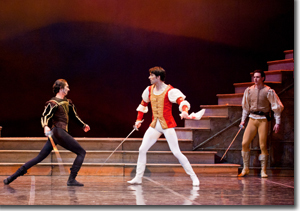 The Colorado Ballet's Romeo and Juliet runs through March 6th. 303-893-4100 or www.coloradoballet.org.